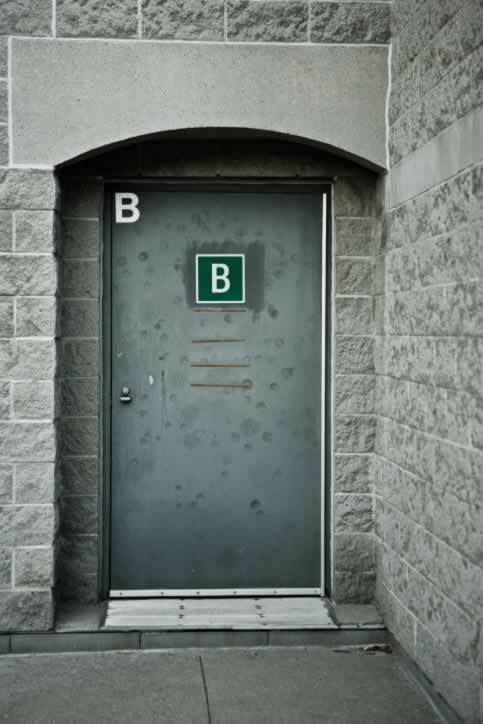 One letter B simply was not enough to mark this large, exterior door. This type of door is called a flush door, meaning that there are no raised or distressed parts of the door, unlike the panel door. These doors still have stiles and rails like panel doors, but the faces are flat. This door has been finished with dull gray sheet metal. The vents added to the center of the door were most likely done after the door had been hung, as the four vents are neither parallel nor equal in length. Fitted with only a door lock, the lack of external hardware suggest that more people are coming out of door B than are going in. The door sweep affixed to the door's bottom rail helps to clear away dirt that would otherwise be tracked inside. In addition, the door appears to have been involved in a greasy food fight or some other attack.